Armored Warfare has finally made its way to the PlayStation 4 after almost two and a half years of PC exclusivity. Falling somewhere between arcade and simulation gameplay, developer Mail.ru is hoping to fill a void on the console. Time to see if the result is a worthy time sink, or if World of Tanks remains the only heavyweight contender in the tank games space. Read our Armored Warfare PS4 review to find out more. Armored Warfare has actually seen a change of developer for the console version. The original game launched on PCs in October 2015, with Obsidian Entertainment at the helm, and My.com publishing. After some apparent drama, development was handed over to Mail.ru, and the free-to-play tank game made its official debut on February 20, 2018. While some in the Armored Warfare community may think the game is best served on PC, the console market can only be ignored for so long, and with the success of World of Tanks, the allure of increased revenue and a higher overall player count were likely reasons for the port. As a free-to-play game, it’s important that anything offered for real money won’t offer a major advantage in favor of the paying players. Generally speaking, premium tanks have unlocks available from the start, but other than that they do not offer tangibly higher stats or anything like that. Premium time can also be purchased, which acts as a boost to earned in-game currency and reputation (points to be spent on tank upgrades and other aspects of the game). It didn’t feel forced on the player, and can generally be avoided by grinding out credits and reputation by playing several matches instead. Much like World of Tanks, there is a heavy emphasis on balancing amongst all tanks, both free and premium. There are five classes of tanks to choose from in Armored Warfare. The Main Battle Tank (MBT) serves as the, well, tank class. These are heavyweights that pack a mean punch, which have forebodingly thick armor; their main drawback is in how slow they are. Light tanks (LT) are the smaller, more nimble cousins of the MBT, boasting higher speeds but lower armor and weaker munitions. Tank Destroyers (TD) look fairly small and innocuous for armored vehicles, yet they pack a wallop at a distance and are designed to take out the opposition before they see what’s coming. Armored Fighting Vehicles (AFV) serve as scouts and are generally keen to stay out of battle, but they can catch a wounded tank by surprise every now and then. Finally, Self-Propelled Guns (SPG) are extreme long-distance machines – essentially mortars on wheels. A special artillery view is available to players using this class, and only this class, to attack enemies even when obstacles obstruct them from line-of-sight. 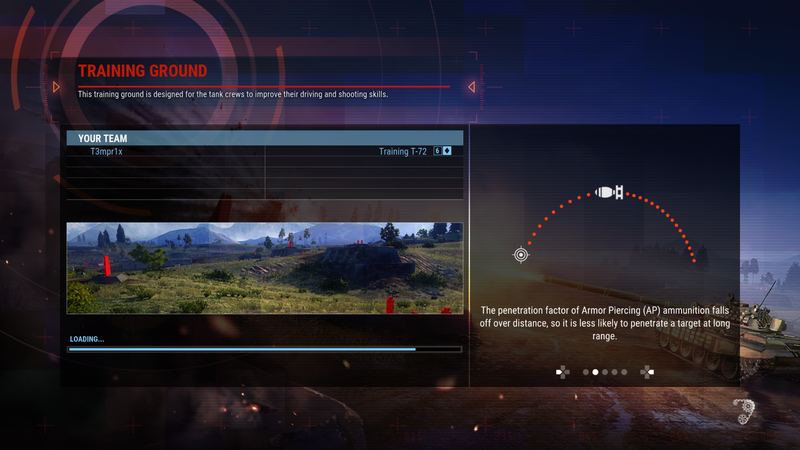 From the outset, Armored Warfare has included both player-versus-player and player-versus-environment game modes. PvP matches allow for up to 30 tanks to duke it out on maps seemingly built to funnel the action to a few hotspots. 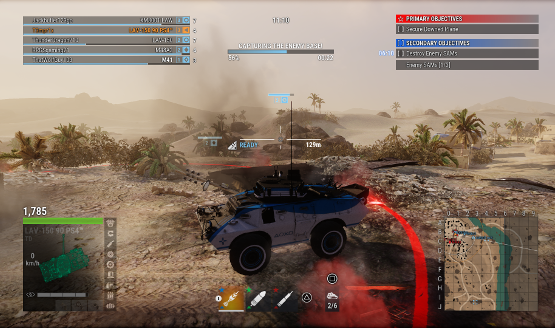 The Global Operations mode pits two teams against one another, plus an AI-controlled neutral team which can provide for bonuses if defeated, or a distraction to be used against the other team. Squads will find more success if they coordinate, and especially if multiple tank classes are used. For instance, a skilled AFV player can enable all teammate’s shots on a tagged target to do critical damage, ensuring a swift victory. Matches are limited to 15 minutes or complete annihilation of the other team, whichever occurs first. Each team has a limited number of tickets, and players can respawn once killed. PvE options include co-op for up to five players. Objectives change in each mission, but usually consist of defending a position, capturing control points, or wiping out enough enemies. Currently, the missions on offer don’t provide much challenge for an average squad, but since they cycle in and out this can change at any time. It is a fun change of pace to work with other players on differing goals, and to do battle against other computer-controlled opponents as opposed to other people. Tanks may be controlled by one player in Armored Warfare, but of course in reality it takes a crew of people to run them. The player’s overall goal is to run a successful paramilitary corporation, and as such, they can hire and use commanders and crew members to give their tanks an edge. Some commanders have certain skills that help with particular tank types, and they level up via a unique grid-based system of skills. Commanders can also be reassigned to other tanks at any time. Non-commanding crewmembers can be hired for each tank in the player’s garage, and they are permanently assigned to their roles on each tank, such as drivers, gunners, and loaders. Upgrading their skills can result in a faster or more responsive tank in the battlefield. Receiving damage close to crew members can incapacitate them, which will result in decreased performance from the tank. It’s a nuanced system that can help those who master it, but it doesn’t have to be a main focus for those who don’t like to micromanage. The CryEngine powers the look and feel of Armored Warfare. This engine is renowned for impressive graphics capabilities. Unfortunately, it feels underutilized here. While tanks are detailed to a decent enough level, the environments feel woefully inadequate. Levels are fairly small, which guarantees quick action, but the buildings and features feel generic and don’t have much going for them. Also, while tanks can run over basically any vehicle smaller than them in real life, Armored Warfare simply transforms any static vehicle touched by a player into a flattened version of itself, instantly. It’s such a jarring effect that I found myself laughing at the result. Trees can also be knocked down, but not before they go through the tank that touched them. These little things may not mean much in the grand scheme of combat, but it shows a lack of attention to detail which may give pause to think about what else is being skimped on. Tanks are also as much about how they sound as how they look. These are some of the heaviest, most destructive machines created by mankind. They are loud, scary, rolling boxes of twisted, reinforced composite materials which strike fear in the hearts of enemies at just the whisper of hearing one in the distance. But in Armored Warfare, a lot of that is lost to generic sound design. It’s hard to distinguish between different tanks, and everything sounds sort of muted. It’s almost as if Mail.ru didn’t want to blast everyone’s speakers with the ear-bleeding sound levels that can occur on an actual battlefield involving tanks, but of course turning up the volume on the television or sound system can rectify this. Customization is a must in any MMO, and Armored Warfare has plenty of that. Beyond paint jobs, weapons can be equipped in different loadouts per tank. Each tank must be leveled up by being used. At a certain experience level, the player is considered a “proven” user of that tank, and all modules can be upgraded. Once 100% of a tank’s reputation is achieved, “renowned” status is achieved, and the next tier of the tank can be used. There are ten tiers of tanks, and stats generally jump up from one tier to the next. Armored Warfare is a decent tank game, but whether it can retain any semblance of longevity on a console flanked with free-to-play games remains to be seen. While World of Tanks may remain the king of tank games simply due to an already entrenched player base, Armored Warfare is a good match for those who prefer a slightly more arcade-like experience. Since the game is free to play, those interested should definitely give it a download. Armored Warfare version 1.03 reviewed on a PS4 Pro. For more information on review scores, please read our Review Policy.